A posthumous exhibition tells an artist’s story through the objects she loved. Above: Valerie Roybal’s wondrous and abstract collages are on view at Sanitary Tortilla Factory. Photography Courtesy of Sanitary Tortilla Factory. According to Sheri Crider, the owner of alternative art space Sanitary Tortilla Factory, in downtown Albuquerque, Valerie Roybal had “been obsessively collecting odd materials for her elaborate installations” since at least 2015. Roybal, who also had a studio space down one of the building’s labyrinthine halls, was in the midst of preparing for her solo exhibition this month when the cancer that had rattled her body for almost a decade took a turn for the worst. A 2015 Pollock-Krasner award recipient and curator of the exhibition Cross Pollination at 516 Arts in 2017, Roybal was best known as a collage artist and backyard beekeeper. 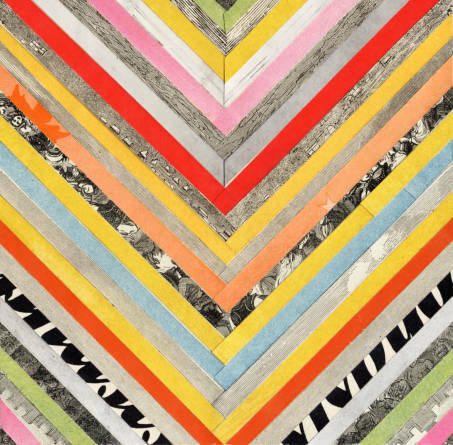 Her colorful and delicate paper configurations appear like cells morphing from one form into another. “Transfiguration, metamorphosis, and transmutation are ideas that I work with extensively,” Roybal wrote in 2013, a few years after her diagnosis, referring to the way her illness had become fodder for creative expression. All proceeds from the exhibition will be donated to Inova Life with Cancer.